Support healthcare in your community through this one-of-a-kind fundraiser! Donate now for an opportunity to display Colleen Rose's painting in your home or office for a month. Spread the love of art as this painting travels across the city. In 2014, Colleen Rose, an art teacher at Nipigon-Red Rock District High School, set up in the lobby of TBRHSC to paint for money – art busking she called it, just like street entertainers. She donated her art busking funds to the Health Sciences Foundation’s Exceptional Cancer Care Campaign, and also donated the finished painting to the Health Sciences Foundation to be auctioned off at the 2014 Tbaytel Luncheon of Hope. The winning bid was made by Laura Fralick, a Certified Financial Planner with Investors Group and, for a second time, the painting’s donation went to the Exceptional Cancer Care Campaign. Laura Fralick is now renting the painting month-by-month to individuals and businesses in Thunder Bay in exchange for a donation to the Health Sciences Foundation. The amount of the donation is up to the ‘renter’ as well as which area of care it is to support at TBRHSC. 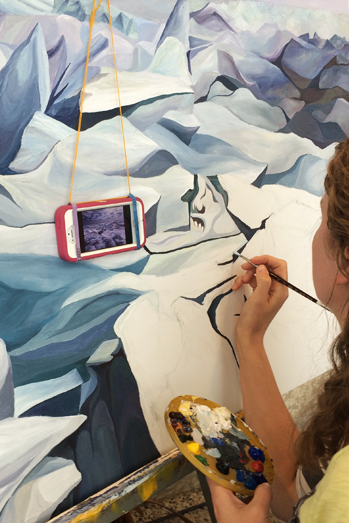 The painting’s journey is being recorded on an attached passport. Interested in hosting the painting? Please check the schedule above for available dates. What month(s) would you like the painting?